This week was supposed to be all ex-bourbon casks, but, since I haven't the foggiest flight of fancy what yesterday's cask was, let's just call it Not-Sherry-Cask week. Maybe. 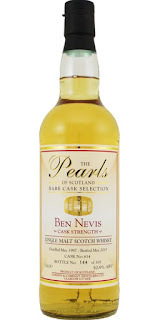 Today's Ben Nevis is truly un-sherried. Heck, it's un-oaked. I tried it along with yesterday's Nevis, and, yes, there were differences between the two. The color is five beer piss. The best color. Lovely spirit on the nose. Lemon curd, orange marmalade, yellow nectarines. Light medicinal, ocean and cotton notes. An old-bottle-effect sorta note, like metallic fruit (sorry, that's best I could do). A sweets-free palate. Limes, minerals, spicy mint leaves. Serrano pepper and a light bitter bite. Oranges. Slight note of musty Nevis funk. It finishes with limes, malt, cayenne pepper and a hint of smoke. The nose is all ink, moss, butter and the smell of a glencairn an hour after its peated whisky has been emptied. Specific! A big herbal bitterness opens up in the palate. Then there's burlap, ink, notebook paper and a mild sweetness. It finishes tangy and bitter. With sweet and smoky residues. This is an example of a very reserved cask that shaved off most of the rough edges and heat, while lifting up the spirit's highlights. Maturation without intrusion. Smart work by G&C. And kind of brave, considering what a wild card Ben Nevis used to be. Josh, over at The Whiskey Jug, liked this one a lot. And he wisely bought a bottle back when it was $75(!). He found the lemon curd in the palate, but also found the orchard fruit note in the nose. If you can still find a bottle for less than $100, and you prefer low-oak single malts, and you like Ben Nevis, then you can do worse than this one!